Just hours after the following blog went live on Tuesday, major media reported that a Texas judge blocked implementation of the new overtime regulation in response to challenges by a group that included 21 states and businesses. The future of this regulation is now in question. On Dec. 1, an additional 4.2 million U.S. workers will potentially be eligible for overtime pay when the annual earnings cap doubles to $47,476 under the new federal overtime rule. Retail workers bracing for the holiday onslaught will be among those receiving overtime if they work more than 40 hours per week but earn less than $47,476. The previous cap, $23,660, was set in 2004. Under the new rule, employers must pay overtime to any eligible full-time or part-time worker, according to the U.S. Department of Labor (DOL), which produced the above video explaining who will benefit from its recent rule change. This will mean bigger paychecks for low-wage workers but permanent raises for others earning slightly more. That’s because one option for employers seeking to avoid overtime pay is to increase annual pay for, say, middle managers to just over the $47,476, exempting them from the rule. We’ve passed a milestone: workers typically spend more than 10 percent of their incomes for their employer health coverage. A decade ago, they spent 6.5 percent on health costs. One reason for the rising cost burden is the growing prevalence of high-deductible insurance plans, and, within these plans, the deductibles themselves are increasing. Although premium hikes in employer plans have slowed in the past five years, they are also still going up. The nation’s aging work force could be another indirect pressure on costs. 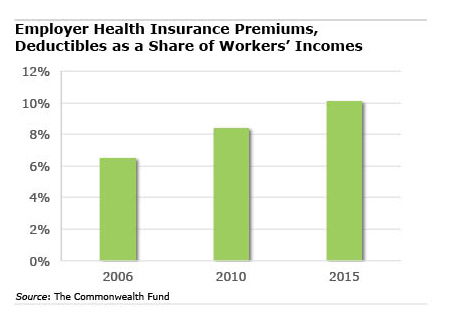 Workers’ incomes have also been going up, but growth remained sluggish over the past decade and “have not kept pace” with employer health costs, the Commonwealth Fund reported. Healthcare news in recent weeks has focused on the 2017 premium hikes hitting people who buy coverage on the state exchanges created under the Affordable Care Act. But 154 million Americans – more than half of U.S. workers – obtain health insurance through their jobs, compared with about 10 million who go through the exchanges, points out the study by the Commonwealth Fund, a healthcare research organization. When premiums and deductibles are combined, health costs are really starting to bite: the typical family shelled out about $6,422 in 2015 for premiums and copayments, compared with $3,531 in 2006 – that’s increasing much faster than the pace of inflation – the report estimated. No wonder one recent survey found only a minority of Americans satisfied with the cost of their health insurance plans. In the Commonwealth Fund’s state-by-state analysis, the level of incomes in a state seem to play a role in the weight of workers’ healthcare burdens. For example, premiums and deductibles, as a share of workers’ incomes, currently exceed 12 percent in low-wage states like Arizona, Florida, New Mexico, Oklahoma, and Tennessee – Mississippi’s, the highest, is close to 15 percent of incomes. Workers in relatively well-off states such as Maryland, Massachusetts, and Washington, however, pay 7.9 percent, 7.3 percent and 8.5 percent of their higher incomes, respectively. In 2013, almost 40 percent of all households ages 55 and over had not paid off their mortgages, up from 32 percent in 2001. 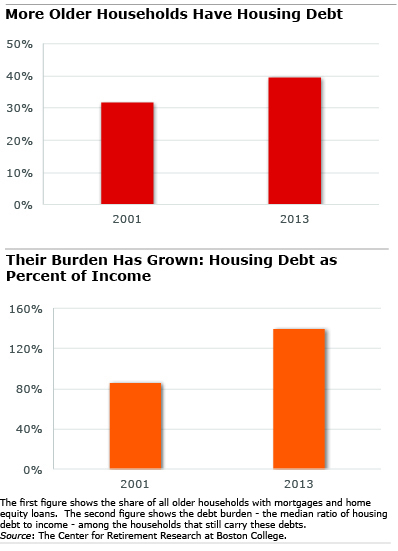 These borrowers were also carrying a lot more housing debt by 2013. During that time span, the housing boom first encouraged homeowners to borrow against their newfound home equity. Then the 2008 bust hammered house prices from Miami to Seattle, reducing home equity and leaving many people holding relatively large mortgages. By 2013, these two factors had combined to exacerbate Americans’ poor preparation for retirement, according to a study by the Center for Retirement Research, which supports this blog. The researchers analyzed the impact of the bursting of the housing bubble on the National Retirement Risk Index (NRRI) through its effect on home equity, the largest store of non-pension wealth for most retirees. The baseline NRRI estimate, using 2013 data from the Federal Reserve’s Survey of Consumer Finances, was that 51.6 percent of working-age households were at risk of having a lower standard of living in retirement. Housing is part of the index, because retirees are assumed to convert their home equity into income by taking out a reverse mortgage. The 2013 NRRI baseline was adjusted to see what would’ve happened if households had not run up their housing debt during the bubble and if house prices, rather than jump up and then plunge in 2008, had kept up their historic pace of increases since the 1980s. In that case, the researchers found, the share of households at risk would have been 44.2 percent – not 51.6 percent. In other words, had the housing bubble and subsequent crash not occurred, fewer households would be at risk of having insufficient retirement income.